Many were outraged recently when the trade data showed Russian exports actually rising in the face of the so-called "sanctions". Bloomberg: - The world’s largest energy producer shipped 2 percent more gas to Europe in the first three months of 2014 than it did in the same period last year, government data show. 1. 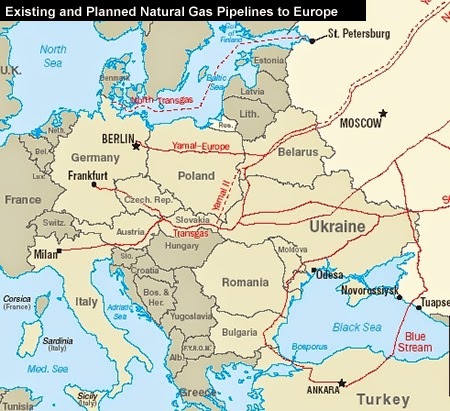 It's well known that in the post-Soviet era, the EU had developed an unprecedented dependence on Russian energy. Given the vulnerability of the Eurozone's economy, there is zero appetite for an energy disruption at this point. Bloomberg: - Russia’s energy shipments are unlikely to be curbed because the country and its Western buyers are too dependent on each other for there to be an interruption ... Europe imports about 30 percent of its gas from Russia, half of which crosses Ukraine. 2. The EU's exports to Russia are worth some $246bn per year. There is no chance the Europeans will want to risk disrupting this gravy train. In contrast, the US exports only about $11bn worth of goods per year to Russia. 3. An even more important factor is the European banking system's exposure to Russia. If Russian companies are told to stop servicing debt to Western banks (in retaliation for example), it will send the European banking system into a tailspin. And as discussed before (see post), the Russian authorities have enormous control over the nation's corporations. French banks are particularly exposed. 4. There are also historical reason that some EU nations, particularly Germany, do not want to rock the boat with Russia. Here is a good article from BBC on the topic. That's why Putin can operate with impunity in Ukraine - his only focus these days is what domestic polls are saying (see article from the FT). Without the EU leadership, there is very little that Western nations can realistically do about this situation.